Tameside Green Party invite you to attend our Annual Summer Garden Party. This year our Summer Garden Party will be held on Sunday 6th August, 2 – 6 pm. All are welcome, there is no cost, you may want to bring food or drink to share. Turn onto Lord Sheldon Way/A6140, Turn right at ‘Ashton Moss’ Metrolink Station. Turn right onto Rayner Ln, Rayner Lane turns left and becomes Moss Lane. 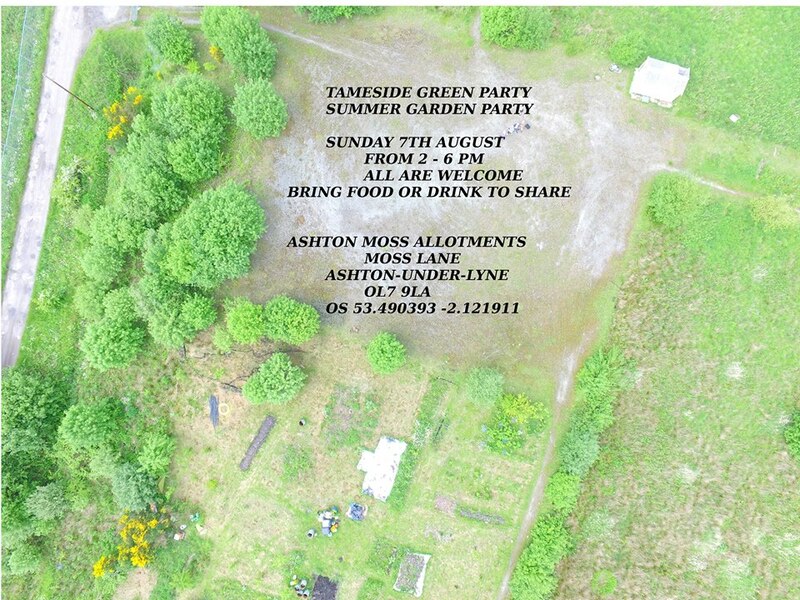 Ashton Moss Allotments will be on the left to the front of Moss Side Farm. Promote Localism The Green Party is committed to developing local economies and empowering local people. To this end we would encourage the development of individual town initiatives and the drawing back of the present central executive cabinet in favour of more locally based decision making bodies with input from local councillors and local people. Local people know what is best for their areas and must have a real say over new developments. They should be able to say no to polluting industries, fracking, and unaffordable housing built by exploitative developers – all to the benefit of investors rather than local people. Local people would be able to identify derelict sites and buildings and ensure satisfactory solutions were found quickly. Local people could quickly identify sites for allotments and local food growing. Take Green energy seriously We would press for all public buildings to be fitted with solar panels and for new public housing to be built to PassivHaus standards, meaning that fuel bills could be as little as £20 per year. We would ensure that the council used a green energy supplier for all its buildings. Retro-fitting of insulation to the housing stock will be encouraged to prevent fuel poverty and reduce carbon emissions. Aim for zero landfill Recycling and re-using should be made easier and people and businesses should be encouraged to reduce their use of packaging and non-recyclable items. Encourage better transport and safer streets Our roads are choked with private cars because public transport is not easy to use. We would work towards greater availability and integration of buses and trains. We would encourage more 20mph streets, without speed bumps, and safer cycling routes designed by cyclists. Make Tameside healthier Tameside is not one of the healthiest areas of the country and growing inequality is exacerbating the situation. From central government we would demand changes in the tax system so that the rich pay more, those with less can enjoy some dignity and the Council can protect care services, community facilities and leisure and green spaces. The present council has come up with a plan to “save” some swimming baths from closure but more scrutiny needs to be given as to how this will come about. Many families in Tameside are now struggling to cope with the changes to social security. Tameside Council offered to pilot Universal Credit and should now commission an enquiry into how this bungled scheme has affected our residents’ health and how many are suffering hunger as evidenced by the rise in food banks. More effort will be put into improving air quality in the borough by traffic restrictions and curbs on polluting industries, thus helping to make residents and particularly children healthier. Scrutinise the Greater Manchester Combined Authority This new body covering the ten boroughs of Greater Manchester has been given extensive powers over: health; planning, housing and regeneration; transport; skills and training and culture. It takes over many of the powers of central government but with even less democratic accountability. Press for Divestment We will continue to demand that the Greater Manchester Pension Fund, based in Droylsden and chaired by the Leader of Tameside Council, give up its investments in fossil fuels and ensure the fund has no links to tax havens or unethical concerns. There are fewer things that light up a child’s face or an inspire a fit of infectious giggles as much as a life-sized sunshine walking into their school assembly, just ask the pupils of Milton St John’s and Micklehurst All Saints Primary Schools in my hometown of Mossley, Tameside. I had the pleasure to talk to them about the benefits of solar power, as they joined with me to help send a very urgent message to Energy Secretary, Amber Rudd, to “Save our Solar” ahead of the Paris Global Climate Talks. The case for solar on schools isn’t hard to make. Depending on their roof capacity, schools are able to pay back their initial investment within 4-8 years. An average sized school can save up to £8,000 a year from exporting energy to grid, revenue from feed-in tariffs and savings on fuel bills. If every school were to make these changes locally then the national rewards would be huge: saving enough money to pay for 6,000 teachers’ annual salaries, generating the same amount of electricity as 380,000 homes do in a year and cutting carbon emissions by the equivalent of taking 110,000 cars off the road – not to mention helping educate children about the urgent need to keep fossil fuels in the ground and protecting schools from over-inflated energy bills. Like me, as a prospective parliamentary candidate Amber Rudd signed Friends of the Earth’s pledge to help schools Run on Sun. She even had a picture of herself snuggled up to the very same sunshine that accompanied me into assembly. Unlike me, she is now in the most opportune position to come good on that pledge. Yet, instead of smoothing the way for schools and aiming for 6 million solar roofs across the UK by 2020, she is fast-tracking fracking and signing cozy deals with the French and Chinese for a nuclear build that ties consumers into paying two-and-a-half times what they do now for electricity. Meanwhile, she’s hit the UK renewables industry with a wrecking ball: removed wind farm subsidies, cut back home insulation funding, withdrawn tax relief for solar farms, and the current consultation on feed-in tariffs (FiTs) proposes to end them completely or reduce them by an industry decimating 87%. For a party that claims to love the free market, the Tories are doing their level best to create a captive one for their friends in gas and nuclear. 20,000 jobs in UK solar are now at risk, £127 million worth of solar projects have been shelved – committing the UK to another 1.2million tons of carbon by 2020 – and schemes like 10:10’s Solar Schools, which has helped 65 schools switch to clean energy, say if the ‘Keep FiTs’ campaign isn’t successful it’s unlikely Solar Schools will run again next year. If the school children I met can work out that the benefits of solar are that it’s clean, it’s free, it doesn’t create any dangerous waste or pollution, and it will never run out, then the Secretary of State for Energy has got no excuse for an energy policy that makes neither fiscal, environmental or ethical sense. Amber Rudd must know that she has to find a way to turn around the government’s current disastrous energy policy. She should start by keeping FiTs and pledging to put solar on the roof of every one of the 29,000 schools in the UK.